An assay’s raw data edit box is used to provide the raw data for analysis; this is the data measured for your plate. In the above example, the entire plate was read and a measured value is specified for every position (96 values here). In this case, remember that it is necessary to define a layout which corresponds to the measured positions on the microplate. This additional step is important because these values could correspond to any positions on the plate. Those positions that were actually read must be defined in a custom layout for the assay in your MyAssays account. The number of measurements specified in the edit box must match the number of used wells. 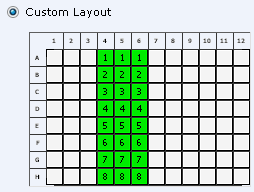 To define a custom layout, use the Microplate tab and pick or use Create Layout to specify the layout. Unmarked (white) positions in the layout have no raw data associated with them. Values must be provided for each used well. MyAssays treats the data provided in the edit box as a row-wise list, i.e. the first data value in the edit box corresponds to the first used well on the plate and the data is read starting from the top-left (A1) progressing rightwards along the first row, with each subsequent row also being read from left-to-right. Data values correspond sequentially to the next used position on the layout. In each case, 24 measurements are supplied to the edit box, however the location of each sample is as defined by the layout. These two examples also illustrate that the 3-column formatting of the original raw data in the edit box is ignored by MyAssays during calculation. 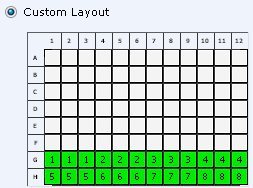 Only the defined custom layouts are used to identify which measurement belongs to which position. A similar convention is used for supplying dual endpoint measurements. Selected assay pages support the analysis of data measured across multiple plates. Click here for further details.